What are you return policies? What are your methods for shipping? What makes a GCDC data logger special? How can I calibrate my accelerometer? How can I extend the data collecting time of my logger? Is the recorded data averaged or filtered? Can I access the acceleromter real-time with my PC? I have an old accelerometer, can I upgrade the firmware? I only need 20g of scale. Is the X250-2 applicable to my needs? How does the deadband work? How do I set the Real Time Clock? Why does the axis register 1 g when the sensor is not moving? My rechargeable logger will not turn on and my PC will not recognize the unit. What's wrong? GCDC was established in 2006 after its founding officers decided to give up their day jobs as government contractors. We specialize in designing and producing products that are as much fun to play with as they are to design. GCDC prides itself on designing, producing, and selling high quality products at a reasonable cost. If you have a specific need we may be able to customize one of our existing devices to your needs. Let us know! We accept credit card purchases using VISA, MasterCard, Discover, and Diner's Card. At this time, we accept orders from the United States, United Kingdom, Canada, Australia, Brazil, Czech Republic, Denmark, Finland, France, Germany, Ireland, Italy, Japan, Netherlands, New Zealand, Norway, Spain, Sweden, and Switzerland. Sales tax is only required for orders shipping to the state of Mississippi. Our products are shipped via United States Postal Service Priority Mail or Parcel Post, or UPS Ground or 3-day Select. Given the small, lightweight nature of our products we recommend USPS services. Allow 2 days for order processing. Price, specifications and terms of offers are subject to change without notice. Customer pays return shipping charges for all RMA services. We reserve the right to refuse service to anyone. Gulf Coast Data Concepts respects your privacy and does not collect or disseminate customer data to third parties. All of the purchasing information obtained from our web site will be used for processing purposes only. The only e-mails you will receive from us are updates to any recent orders and/or returns. However, that doesn't mean our ISP or store front sponsor doesn't collect websurfing information. Check here for further information. Gulf Coast Data Concepts provides exceptional data acquisition systems at very reasonable costs. However, if our customer believes that our product is defective or does not perform to specification, it may be returned within 30 days for a refund of the purchase price. A Return Merchandise Authorization (RMA) number must be obtained from our sales department prior to returning the product. The customer is solely responsible for shipping any returned product and agrees to use only reputable carriers capable of providing proof of delivery and insurance for the entire value of the shipment. The customer agrees to bear all shipping and insurance charges and all risk of loss for the return product during shipment. The customer agrees that all returned products will be 100% complete and undamaged. We offer several shipping options provided by United States Postal Service (USPS) and United Parcel Service (UPS). You can read more about these services here. Our data loggers are easy to use, include excellent capabilites, and are offered at very affordable prices. Read more about our data logger product-line features. 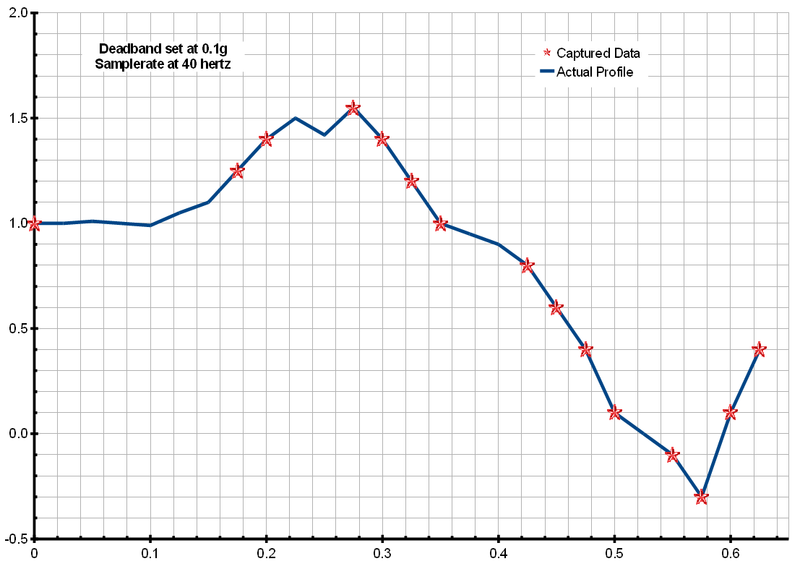 Every accelerometer has some offset error but remains linear within 2% throughout the full-scale. The X250-2 will typically have 5-15g offset error on any of the three axes. Correcting the offset error of the sensor will result in very accurate g-force data. The calibration procedure we developed uses zero g and one g to provide offset and scaling factors. Please refer our calibration procedure for complete instructions. However, this method is not applicable to the X250-2 impact sensor. How can I extend the data collecting time of my X6-1A, X6-2, or X250-2? A 5 volt supply at the USB connector will provide external power to the logger. Commercially available USB chargers or USB battery packs will provide a 5v supply without USB communications, like those sold at Walmart, Best Buy, and other electronics retailers. In the case of the AA battery powered logger, the most efficient method of powering the device externally is by connecting a 1.5 volt supply directly to the battery terminals. 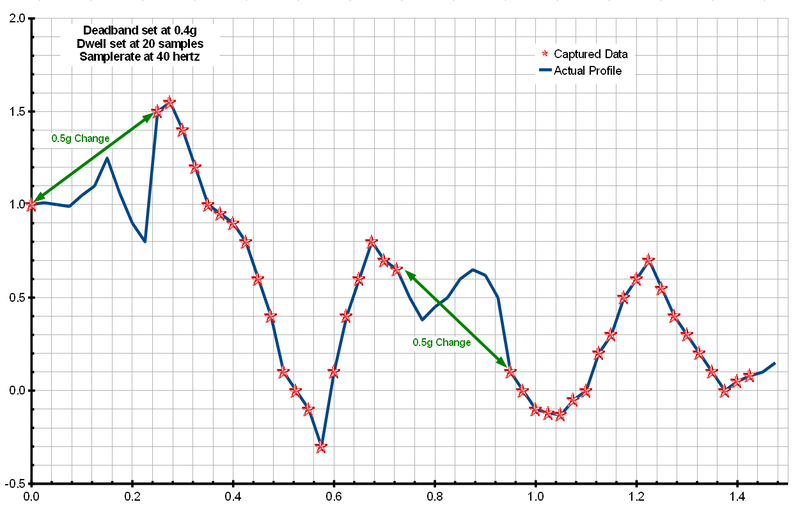 In the case of the X16-1D, X16-4, and X2-2, the sensor is oversampled, averaged, then processed through a finite impulse response (FIR 64 tap N4R4M2). The X50-2 and X250-2 sensor output is oversampled 16X and averaged. Can I access the accelerometer real-time with my PC? Yes. A HID data pipe can be established to provide real time access to the accelerometer sensor data, the real time clock, and diagnotics. Contact our technical support staff for further information about the HID feature. Yes, in some cases depending on the hardware design level. Please contact our sales department for instructions on how to return the unit to GCDC. We will upgrade the firmware and return the device promptly. The X250-2 provides 14-bit resolution. Considering the technical setup of the sensor, at low gain the X250-2 spreads the 14-bit resolution over a full-scale of 625 g's. (There is a certain amount of capability beyond 250 g's that must be considered. However, this region is non-linear and output is not accurate.) This means that there are 26 counts of resolution per g registered by the sensor. The following table lists the resolution achieved at several scales. How does the deadband and dwell work? The deadband function is an effective way to reduce the amount of data collected and extend the system battery life. The deadband causes the system to "sleep" until a threshold is exceeded. A new sample from the accelerometer sensor must exceed the previous recorded reading before the microcontroller records the new data. The deadband setting is expressed in "counts" units from the sensor and is applied to the output of each axis. The equation to convert counts to g-force is included in the user manual. The deadband timeout feature will force a sample write periodically regardless of the deadband setting. This deadband timeout value is expressed in seconds. This feature ensures periodic data is recorded during very long periods of inactivity. If the timeout is set to 0 seconds, the deadband setting is ignored and the device records constantly. When deadband and dwell and used together, the device records a number of consecutive samples at the set sample rate after motion exceeds the deadband threshold. The deadband value defines the threshold. The dwell defines the number of samples to record. Deadbandtimeout ensures periodic data is recorded. The Real Time Clock (RTC) is set using a text file named "time.txt" located in the root directory of the microSD card. The system looks for the time.txt file upon booting. If the file exists, the time stored in the file is loaded to the RTC and the time.txt file is deleted. The time information in the time.txt file must be in the exact "yyyy-MM-dd HH:mm:ss" 24-hour format, occur on the first line, and end with a newline character. The time file method of setting the RTC does not require any special communication drivers to the device so it can be implemented from any text editor. Direct initialization of the RTC is possible but requires the use of special drivers and software (contact our technical support staff for further information). The MEMS accelerometer sensor is sensitive to constant acceleration or 0 Hz (DC). This means that the sensor will register the constant force of gravity as 1 g. The RMS result of the three axis will indicate 1 g. If the sensor is positioned orthogonal to gravity, a single axis will register 1 g.
First, make sure the two-pin battery disconnect is connected. Plug the device into a USB port and allow a few minutes to charge the battery. The device should reboot and mount to the host computer. If the device is still non-responsive, open the enclosure and remove the two pin battery disconnect. Replace the connector and the device will reset. The system should now begin to operate properly. Reconnect the device to the USB port and allow the battery to fully recharge.